This is the 1st day of the Lunar New Year (2008). Wishing one and all - Blessed New Year and Good Health to you and your loved ones. 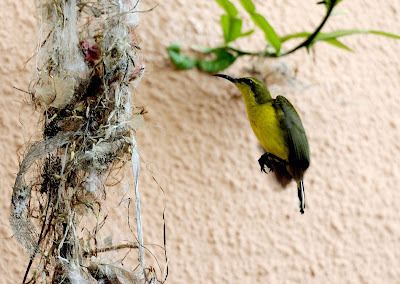 As tradition dictates, we were out visiting relatives, and in one of our stops in Bedok and in the balcony, a Olive backed Sunbird (Nectarinia jugularis) was building a seemingly untidy nest. The site of the nest was a Kaffir Lime tree (Citris hystrix), and there is a good reason for choosing such tree, for the Kaffir Lime tree is full of spikes. 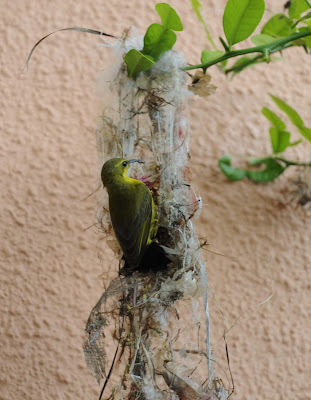 But then since it is building its nest in the balcony, it has nothing much to fear! Apparently this individual is quite use to the presence of human, and I was able to be very closed to the subject, in fact about 1 m away. Though I was capturing the building process with speed of 1/500 sec, the fluttering of the wings were blurred. 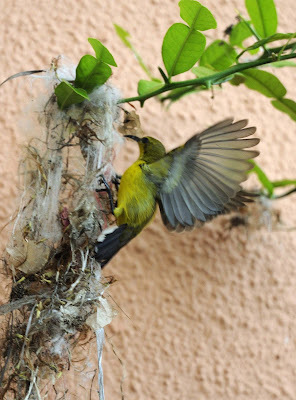 With great mastery of flight, this sunbird seems to be suspended in mid-air, with wings folded, it was coming in to land on its partially build nest. 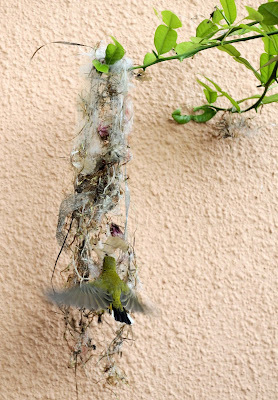 And then it landed, and busied away with the nest building. 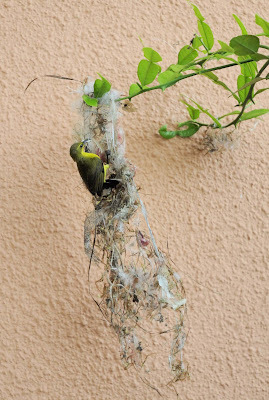 I wondered how the nest eventually will look like, will have to check at later stage. Wow...now u can watch the entire process. 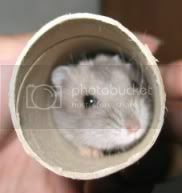 Hopefully its a successful nesting.